This Father’s Day we have teamed up with VEGEMITE to bring you a very Aussie Father’s Day feast! Heat the oven to 180°C and arrange a rack in the middle. Set a wire rack on a baking sheet and place it in the oven. Whisk together the flour, baking powder, and salt in a large bowl to aerate and break up any lumps; set aside. Place Farm Pride eggs in a second large bowl and whisk until just broken up. Add the milk and, while whisking constantly, slowly pour in the melted butter until evenly combined. Add the VEGEMITE and cheese. Stir until combined. Add the milk-cheese mixture to the flour mixture and stir with a rubber spatula until the flour is just incorporated and no streaks remain (the batter may have a few lumps); set aside. Heat a Belgian waffle iron to medium according to the manufacturer’s instructions. Once heated, fill it with batter, close the lid, and cook until the steam starts to diminish (open the top and peek for doneness after a few minutes). Transfer the waffle to the wire rack in the oven to keep warm. Repeat with the remaining batter. 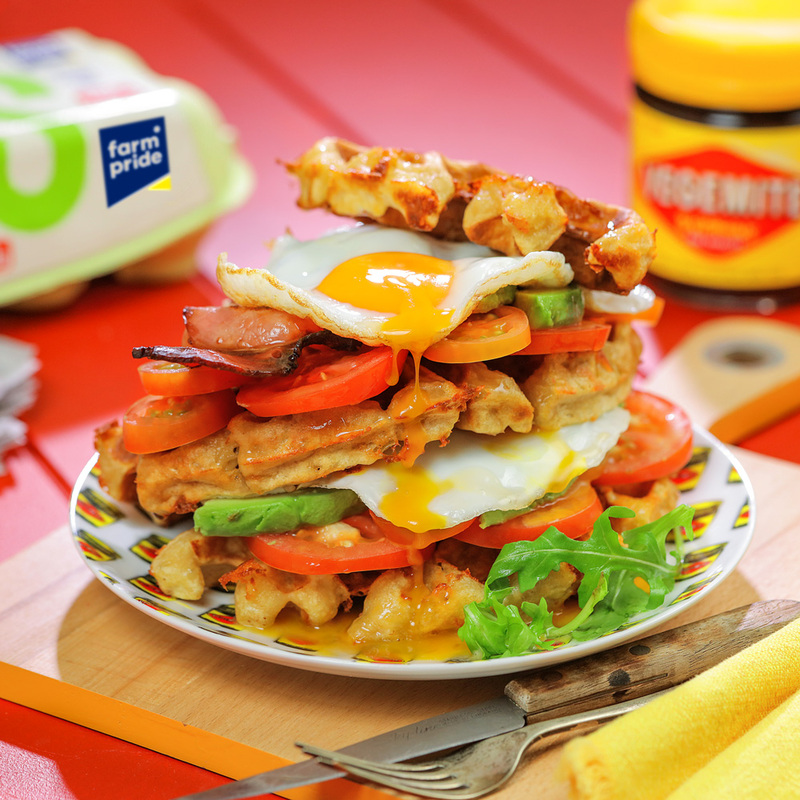 Stack the waffles with layers of Farm Pride eggs, avocado, tomatoes, rocket or bacon.